Located on the crescent of Dubai’s Palm island, The Royal Atlantis Resort & Residences will introduce a record-breaking number of pools within one five-star development. The total of 90 swimming pools will provide a microclimate throughout the building, courtesy of New York-based architects Kohn Pedersen Fox, as well offering an enviable number of places to lounge and cool off at for residents and guests alike. The property also features an enviable Sky Pool elevated at 90-metres as well as jaw-dropping water fountains and aqua features throughout. Debuting as Dubai’s first ‘super prime’ residences, The Royal Atlantis will offer 231 luxury apartments with interiors by Sybille de Margerie, comprised of two, three, four and five-bedroom residences ranging from 1,400 to 17,000 square feet when it opens in 2019. Additionally, the property will feature 795 hotel rooms and suites. Located on the crescent of The Palm next to the iconic Atlantis, The Palm resort, this new generation of residential luxury offers a sophisticated lifestyle experience encapsulated in dramatic architecture. Situated on the 22nd floor, is the Sky Pool, the jewel in the crown of the development’s collection of 90 swimming pools. 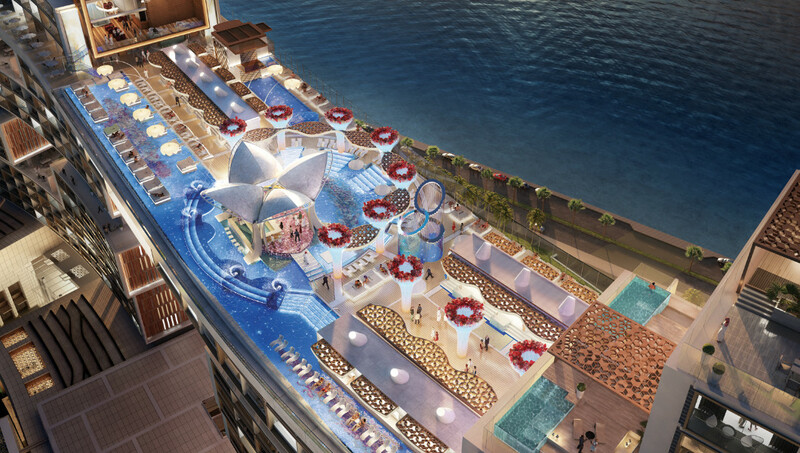 The 90-metre-high infinity pool will include lounging areas, a DJ booth, private cabanas, bars and restaurants. The space itself has been meticulously designed, featuring unique architectural elements to help the space transition from a relaxing day-time destination to a sophisticated nightlife spot that will redefine entertainment in Dubai. In addition to the exquisite sky pool, residents of The Royal Atlantis will have access to the premier residence pool situated at beach level aside the property, with its own private beachfront overlooking the water. Additionally, the property offers a family pool, children’s pool and resort pool providing something for everyone. “The Royal Atlantis Resort & Residences is the first development of its kind. 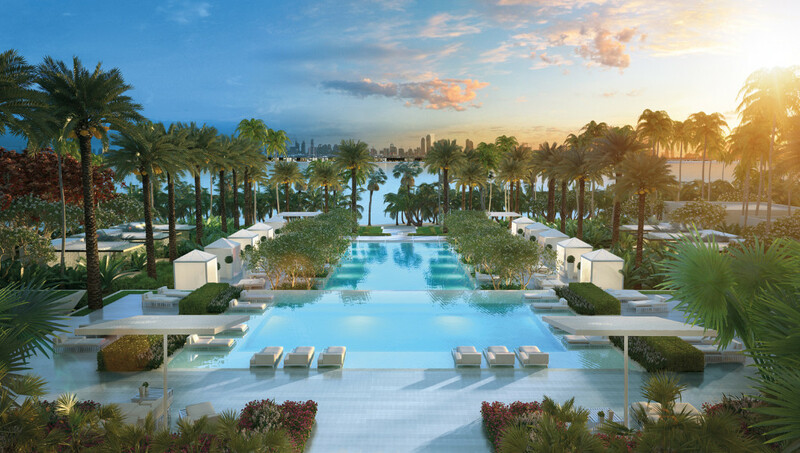 Once finished, it will take luxury living to the next level and being home to 90 swimming pools is just one example of how this development will be different to any other super prime project globally,” said Maria Morris, Partner and Head of Residential at Knight Frank Middle East – the exclusive global sales agent.